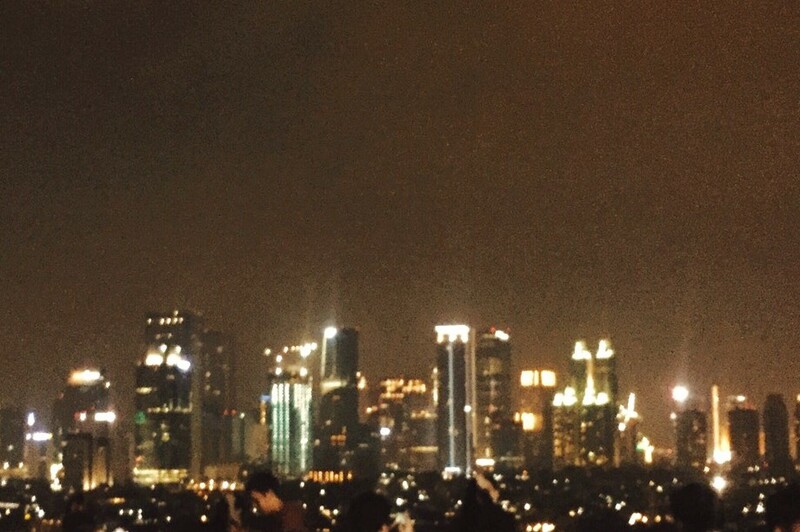 It was 9 pm, Saturday night, in SCBD, Jakarta. the night was so breezy as the wind made noisy sound; I could hear it passed by on and on. There were me and him, two young adults, pretending to be clueless on what to do though we have too many deadlines. But somehow, the night felt so perfect. Things just disappeared on my mind except for the fact that I was walking beside this tall, dashingly funny guy, with straight yet wavy dark medium-length hair, not to mention that he left it messy because of the wind. He was wearing a black sweater and jeans that was ripped on the right knee, grey-colored stripe socks, and white converse. While I was wearing a monochrome flannel shirt both hands folded up to elbow, black jeans, and black vans. He asked me whether it was too cold to be outside at this hour, but I said no, because in fact, it was the truth. I felt incredibly fine. Despite of all the cold wind, his laughter gave me warmth. We were strolling around without having any clue where we were going. To be really honest, we weren’t really familiar with the street, because we happened to not live hereabouts. But we were just strolling and talking and laughing and enjoying the moment as much as we could. Talking about the street, the later, the more people on the street. Some of them were going to the bars and clubs, the apartments, even the malls. And some of them, were just like us, strolling around the street and enjoying the cold night out. It was a busy crowd, I believed. Even there was a drunk person with his friends waiting for their taxi. It was just 9 pm, but a drunk man was already in our sight. Not our business, not our business at all, but it was funny to talk about how his friends carried him along. This guy, the guy I was strolling with, was indeed a hilarious guy. The heat of my body because of the laughter was the cause I didn’t feel cold wind at all. The wind fondled through my hair, as I observed it fondled through his, too. The city lights were so perfect; and so was his laugh. The lights rebounded to his brown eyes, it was so mesmerizing. The skyscrapers stood tall, breaking through the dark sky. The top of it was still visible, because of the light it radiates. The sky was so dark and hazy. It was a mixture of the darkness of night and the greyness of the presence of the upcoming storm. The night must be a horror situation for ordinary events, but tonight, as I remembered, I almost forgot how a storm really frightened me. His laughter penetrated the mumbling sound of the thunder. It was too contended with happiness, caused me hate thunder less. It was 11 PM, time went by too fast. He kept on asking me whether it was too late for me to go home and I, with all the certainty, answered no, simply because I didn’t want us to go separate ways and end this beautiful night. The thunderbolt and lightning were crashing in the sky. I could see the lightning reflected on the glass-like building. Not long after that, it started raining. With only a layer of clothing, which was a flannel shirt, of course I drenched in rain. We both were running looking for a building to protect ourselves from the rain, since most of the buildings on the area we went were protected by gate and security which were closed considering it was almost 10 pm, on Saturday night. We finally found something like a bus stop with of course, a roof above it. Most of the bus stops I saw were already filled with people, we felt lucky we finally found one that was empty. We were laughing and I ran out of breath since we were running trying to avoid the rain. I noticed that this part seemed like what a K-Drama would present, but it happened to me. Once. We both were damp. My wet flannel shirt felt very uncomfortable. The sound of the wind and the rain was almost blustery, and again, the reflection of the dreadful lightning on the glass-like building really frightened us. Not long after we sat there, a couple of teenagers were also used the bus stop as their shelter from rain. They were laughing and chatting so loudly, almost like screaming. It made both of us uncomfortable so we stood up. Even though the moment was not pleasant, we both ridiculed them by holding back our laughter because of the conversations those teenagers had. The girls were screaming because she drenched in rain, which I thought at the moment, was very annoying. I sort of made a “face” to him, signaled how annoyed she made me, and he laughed. He laughed so loud made the girls and their boy friends looked at us for a second. I looked back at them, and I laughed too. It somehow seemed like we both had an inside joke. It was not a romantic moment, I believe. It was more like a funny moment. Me and him have known each other for quite a year, since we both went to the same school and he is one of my classmates. We have only had a decent chat over Line for a month. That exact moment made us felt really close, like we have been best friends in our previous lives. The teenagers stopped talking, we both stopped laughing. I just stood there, staring at the city lights that were so beautiful with the falling rain that started to fell subtly. The lights made the rain had colors. It gave shadows from the bounded lights. The optical rays awed me. I looked at him for a second, and he was also staring at the building somewhere somehow. I did not know whether he was observing the lights, the rain, or his mind was just empty and he was musing. I wish that I could see what lays underneath his mind. I wished to see whether he felt the same as I did, or the opposite. It would be tragic if he felt the opposite. He asked me whether I felt cold or not, I answered yes and I frowned, then he said, “same” and he frowned too. I believed, he was mocking at me for saying yes and frowned. We both laughed. The image of the lights from the buildings and how the red light (from the traffic light, since we stood nearby it) rebounded on his shining hair still visible on my mind. I could not look into his eyes for more than 2 seconds. The butterflies inside my belly were being chaotical. It was quite a busy street. There were so many cars passing by. A couple of cars were honking the horn. A car was speeding and splashed a little amount of rainwater to us. The teenagers, of course, being teenagers shouted at the car and got furious. Me and him goggled our eyes and laughed. When the rain began to stop, we both left the bus stop and walked back to Pacific Place, where he parked the car. We both were soaked up in rainwater, but still managed to walk confidently. I did not even think about the stares. I did not care about our surroundings. I remember perfectly that when I checked on my phone screen, it was 10.25 pm and suddenly he grabbed my hand and held it. I looked at our hands holding. I did not have the courage to look at him. He wasn’t looking at me too when he held my hand. He was looking straight, as I peeked at him. It was pretty awkward, yet so precious. If I could be dramatic, I swore that I felt the city lights were dancing. Oh my, it was so beautiful. On our way to the car, we did not talk at all. The holding hands spoke for themselves in case anyone asked. We strolled quite far from where we been. Fortunately, the wind was not as cold anymore. In fact, it was kind of breezy. SCBD was beautiful. The street was busy and noisy. The city lights were magnificent. He was and is, a dear. But sadly, the night has to end.